U.S. corn farmers are among the most productive in the world, generating a record harvest of nearly 14 billion bushels in 2013 -- enough corn to fill a freight train long enough to circle the Earth. This production supports a mammoth agricultural sector comprised not just of farmers, but also major food, meat and energy companies that have an enormous stake in the long-term productivity and resilience of American agriculture. However, in the face of this bounty, three major threats to U.S. corn production loom: climate change, unsustainable water use and inefficient and damaging fertilizer practices. 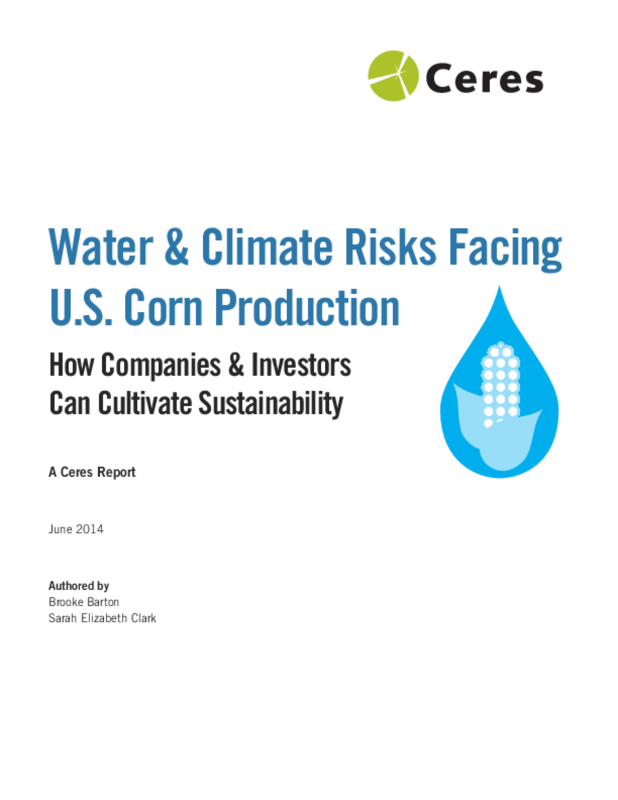 Ceres' new report analyzes the risks facing U.S. corn production. The report provides recommendations for how corn-buying companies and their investors can catalyze more sustainable agricultural practices, while helping farmers preserve and enhance yields, and protect precious water resources. The research is accompanied by new data and interactive maps that highlight irrigation risks and fertilizer pollution hotspots.